This isn’t a traditional risotto, though. Nah, we’ve opted out of the rice, and instead replaced it with our favorite grain: wheat berries. We just can’t get enough of these chewy, nutritious, cold-climate loving little buddies! Only, Mike’s dad, Tony, just informed us that wheat berries bought in America take forever to cook, and aren’t even remotely done when our recipes claim they will be. Some googling later, and we’ve come to the conclusion that what we buy here (called matvete in Swedish), is really called “pearled wheat” in the US. 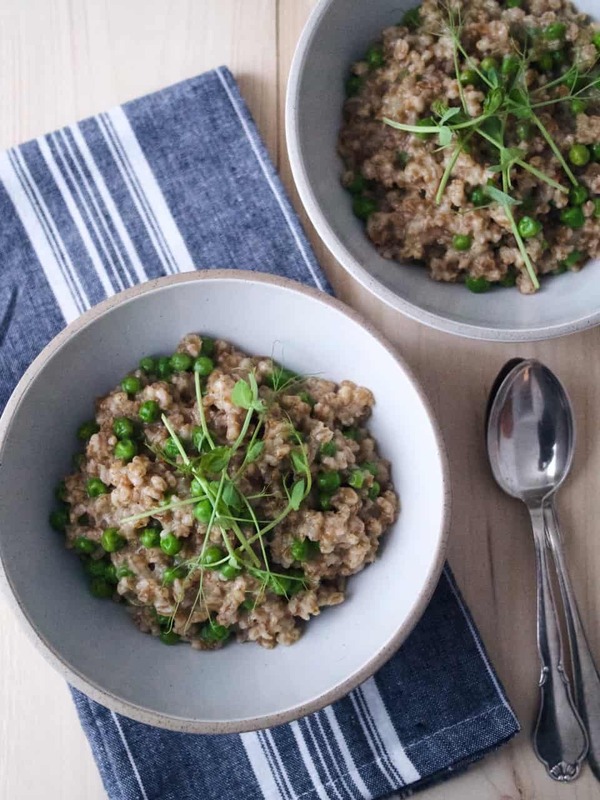 These grains have had some (but not all) of the bran (kli in Swedish) removed, which makes for a shorter cooking time and a more tender end product. When thinking back, we can both recall cooking wheat berries (that is, actual wheat berries) for up to an hour when living in New York, so this really seems an appropriate clarification. But back to the dish in question – pearled wheat, peas, vegetable bouillon, some grated cheese and a few sprigs of pea shoots. That’s it. The latter we grow on a little tray on our window sill, and the tall-reaching, bright green shoots aren’t minding the foot of snow and freezing temperatures on the other side of the pane of glass one bit. All in all, this ‘risotto’ is a winter season winner, despite the lack of hardy vegetables. Filling, nutritious, climate-friendly – and with a hint of spring, even. Oh, and it’s pretty good for athletes, too. Check out the nutritional information below the instructions, if you’re interested 🙂 That’s all – hope you’ll like it! In a medium saucepan, combine the water and bouillon and bring to a simmer. Reduce heat to low. This broth will be slowly added to the risotto as it cooks, so keep it hot but not simmering. In a large saucepan or enameled dutch oven, heat the olive oil over medium heat. Add in the onions and salt, and sauté for 5 minutes. Stir in the pearled wheat and cook for a minute or two. Then, add in 4 dl of the broth, and reduce heat to medium-low. You want the liquid in the pot to maintain a slight simmer. Stir frequently. After the liquid is almost completely absorbed, add in 1.5 dl of broth. Keep going like this, adding more broth to the pot as needed. Keep stirring every now and then to avoid sticking. When there is 1.5 dl of broth left (this should take about 30-40 minutes), stir in the frozen peas and the last of the broth. Once the liquid is absorbed and the peas are heated through, remove from the heat. Stir in the lemon juice and cheese, and season with black pepper. Garnish with pea shoots if desired. Serve immediately. Nutritional information (based on 2/4 servings): Protein: 30/15 g, Carbohydrates 108/54 g, Fat 25/12.5 g, Energy 777/388.5 kcal. Blanda vatten och buljong i en medelstor kastrull. Koka upp, och sänk sedan värmen till låg. Håll buljongen varm, men inte så att den sjuder eller kokar – denna skall tillsättas till risotton allt eftersom. Hetta upp olivoljan i en stor gryta eller tjockbottnad kastrull, och fräs sedan lök och salt i 5 min. Rör ner matvetet och låt steka med i en minut eller två. Tillsätt sedan 4 dl av buljongen, och sänk värmen till medel/låg. Vätskan i risotto-kastrullen ska sjuda lätt. Rör ofta. När vätskan nästan absorberats helt, tillsätt 1.5 dl mer buljong. Fortsätt sedan så – tillsätt buljong efter behov, och rör ofta för att förhindra att risotton fastnar i botten. När ungefär 1.5 dl av buljongen återstår (det tar 30-40 min till detta steg), rör då i ärter och resterande vätska. I samma stund som det sista av buljongen absorberats och ärterna är genomvarma, ta grytan från värmen och stäng av plattan. Tillsätt citronsaft och ost, och rör samman. Smaka av med salt och peppar. Dekorera med ärtskott (valfritt). Servera genast. Näringsinformation (baserat på 2/4 portioner): Protein: 30/15 g, Kolhydrater 108/54 g, Fett 25/12.5 g, Energi 777/388.5 kcal.